Create the creamiest, most decadent cocoa for a crowd with Slow Cooker Hot Chocolate. This easy recipe will be a hit at your next holiday party. Combine heavy cream, milk, and evaporated milk in a crockpot. Add chocolate chips, vanilla, and cinnamon sticks. Stir and put the lid on. Cook on low for 3-4 hours, or high for 2. Stir once during the cooking process. To serve: top mugs with whipped cream, and a sprinkle of cinnamon. 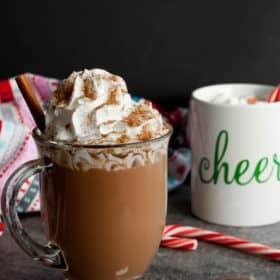 This slow cooker hot chocolate will keep in the fridge for 3-4 days or 2 months in the freezer. The top of the slow cooker hot chocolate may develop a "skin" of chocolate on the top. Simply stirring it will return the cocoa to a smooth uniform appearance.